Christina Ortmeier-Hooper was interviewed for NCTE by freelance writer Trisha Collopy. For the English teachers in Christina Ortmeier-Hooper’s workshop, it was the longest seven minutes of the day. She had asked them to respond to a prompt in a language other than English. As the seconds ticked down, some struggled through, crossing out words and sweating verb tenses, some switched topics to something that matched their limited second language vocabulary, and some simply gave up. The exercise is a shorthand for the daily struggles English language learners face when writing in a second language. 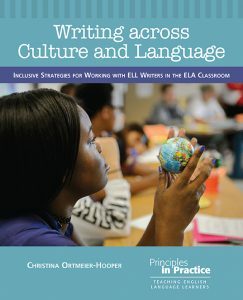 In her recent book, Writing across Culture and Language: Inclusive Strategies for Working with ELL Writers in the ELA Classroom, Ortmeier-Hooper argues that ELL students are falling through the cracks in mainstream English classes. “One of the default positions is that if a student is struggling with writing, we need to go back to basics,” such as drilling students on grammar, sentences, and paragraphs, says Ortmeier-Hooper, who has taught in both ELA and ELL classrooms. But that approach cuts short the experience students get with longer, more complex writing projects—leaving many stuck on remedial academic tracks. “They don’t develop confidence; they develop a lot of fear,” she says. With ELL and multilingual students estimated to make up a quarter of all public school students by 2025, Ortmeier-Hooper points out it’s important for ELA teachers to add strategies that will help these students build their writing skills. And teaching strategies that help ELL students—better assignment design, stronger revision strategies, and clearer feedback—ultimately benefit all students in the room. Inside and outside classrooms, Americans are living in a culture that is at once more global, and also more anti-immigrant, than at any recent time. In the book, Ortmeier-Hooper describes an Iraqi refugee, Ahmed, who texts friends in English, Turkish, and Arabic, watches soccer on Telemundo, and acts as a translator for his parents. But in his English class, this multilingual teen has “started to embrace anonymity because he feels like he doesn’t see any other choice,” she writes. As a starting point in a multilingual classroom, ELA teachers can give students assignments that offer them entry points to talk about their literacies, identity, and community. “It opens lines of communication with students,” she says, and it can uncover literacy lives that are often hidden in monolingual classrooms. “Writing is a lot about risk-taking and trust, so I think teachers need to find a way to build that trust,” she adds. A second important step is assignment and curriculum design. In ELA classes where teachers are often pulled in many curricular directions, “there’s a tendency to front-end load a lot of writing instruction,”says Ortmeier-Hooper. Teachers may put a lot of time into the invention stage of a project, mapping, webbing, helping students come up with a good topic and in getting out a first draft. But then the class runs out of time for revision. For students writing in a second or third language, first drafts take even longer. By the time they’ve decoded the assignment, read new articles or texts, mastered new vocabulary, and wrestled their ideas onto the page, “they literally run out of time,” says Ortmeier-Hooper. That cuts out time on the back end of the assignment for revision, which can be a crucial time to deepen the draft, to rethink audience and purpose and play with language. But then the class rushes on to the next assignment, and ELL students have to start from scratch on a new assignment. A teaching strategy that Ortmeier-Hooper says can work at all levels of writing instruction is called a Big Paper approach. The overhead approach makes the text visible to all students in the room and also allows students to mark up words and follow the discussion more closely. “It’s a really powerful way of sending a message that writing can be changed to have different effects on readers,” says Ortmeier-Hooper. “It helps the teacher lead specific conversations around writing, to say, ‘Let’s look at this, let’s take this apart, seeing what’s happened to here,’” she says. The common text brings ELL students into the conversation because they aren’t constantly grappling with a new text or set of vocabulary. Exercises like this can deepen the class discussion, according to Ortmeier-Hooper, even as they allow ELL students to feel like they’re on a level playing field. “Imagine if you had all 25 students in the room actively engaging and questioning and thinking more concretely about audience and purpose, about how the text is working. That benefits the top 10 students in your class as well as everybody else,” she says. While there’s much work to do to make English classes more inclusive for ELL students, Ortmeier-Hooper believes ELA teachers are up to the challenge. “The wonderful thing about ELA teachers is that they have been years ahead of the curve in embracing multicultural literature and diverse literature in the classroom. That’s been a real strength,” she says. As English teachers see the number of multilingual students in their classrooms grow, she’s optimistic that they will adapt to this new normal. “I think all the intentions are in the right place. I think figuring out how to do it is the hardest part,” she says. Trisha Collopy is a Minneapolis writer and a copy editor at the Star Tribune. She has written for the Washington Post and the Star Tribune, among other publications. She has taught first-year writing and currently mentors first-generation college students through 360 Journalism at the University of St. Thomas in St. Paul. Read a sample chapter from Writing across Culture and Language or order the book.